What’s this? The Santa Claus Parade is today? Means the holiday season is upon us (the cold definitely is!). Also means it’s time to get crafty. Over the years, at magazine prop sales, I’ve scooped up beautiful hand-block-printed wallpaper remnants and rolls to repurpose as pretty packaging and cards. I never buy gift wrap, preferring to recycle newspapers, fabric and wallpaper instead. I also don’t buy cards – why buy when you can make? And if you’re gonna make, make ’em pretty! Here’s one of my favourites. This card is a cinch to craft. All you need are card stock, wallpaper, a button, a pencil, a ruler, an exacto knife, white glue and scissors. Here’s what to do. Using exacto knife and ruler, cut card stock and background wallpaper to size (you can use an old card as a template). Fold card in half, either lengthwise or widthwise. On inside of card, score length of fold using exacto knife and ruler. Thinly spread white glue over front and back outside of card (don’t apply glue to the inside!). Affix background wallpaper, being careful to align edges with card’s edges; press down on paper firmly (as if using a squeegee) to remove any air bubbles and glue clumps. Wipe off excess glue from edges. 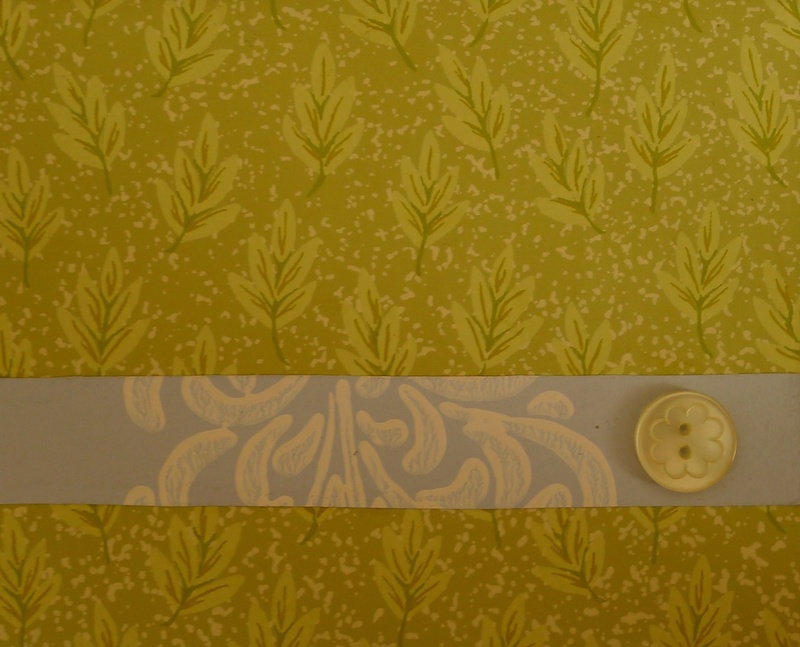 Cut out strip of coordinating accent wallpaper, trimming length to fit width of card. Apply glue to back and attach to card front. Add few dots of glue to back of button and affix to accent paper. Let dry.